Mistake #4 is actually two mistakes, both commonly occurring during bicep curls. 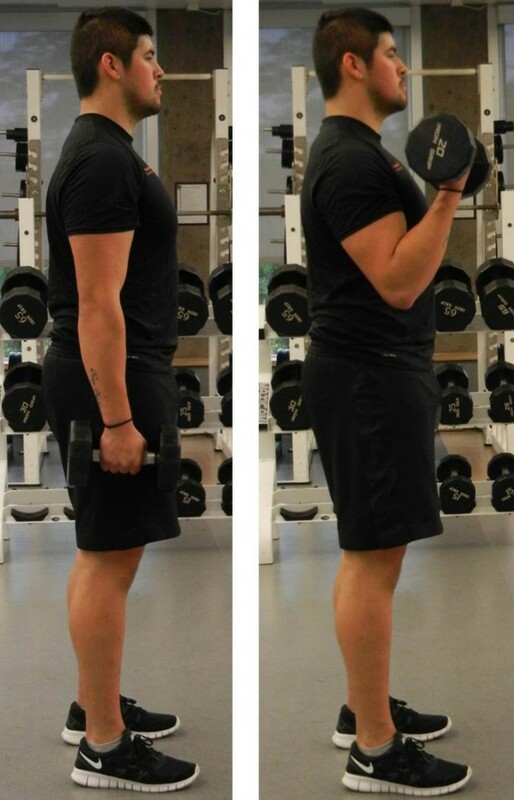 When doing bicep curls I often see people “swinging” the weights up, using their hips to gain momentum. Another mistake is allowing the elbows to migrate backward, in other words, starting the lift from well behind the torso. These mistakes aren’t real dangerous unless you swing your hips so hard that your back hyperextends – don’t do that. The biggest reason they are problematic is simply this: you’re wasting time by making the exercise easier and less effective. Momentum coming from your hips/torso is a force – one that significantly reduces the amount of force your biceps must produce. Depending on your degree of “swing” you may even be allowing momentum to complete up to half the lift, so your biceps are only actually working within a small range of motion at the top of the lift. The further you bring the elbows behind the torso, the more you recruit your delts to execute the curl. This isn’t all that bad, but you’re likely already doing another exercise for your delts such as a delt fly or an overhead press. So if by doing this exercise you’re looking to get the most benefit for your biceps, avoid bringing the elbows way behind you. Try doing your bicep curl starting with your elbows by your sides and keeping your torso completely still, lifting the weights in a controlled manner. You will likely find it much more difficult!